Ballet manga, in which the heroine withstands numerous trials to become a notable dancer, is very popular among Japanese girls and women, and has greatly contributed to the establishment of ballet in Japan. The genre emerged during the 1950s; with an increase in its popularity, more children began attending private ballet classes, since Japan had no official ballet schools. After some decades now, many Japanese dancers have begun winning international dancing competitions. While most ballet manga is fictional, some examples have been based on the lives of famous ballet dancers such as Vaclav Nižinskij and Maria Tallchief. This according to “The relationship between ballet and manga in Japan” by Yukiyo Hoshino, an essay included in Writing dancing/Dancing writing (Birmingham: Society of Dance History Scholars, 2014, pp. 103–106). 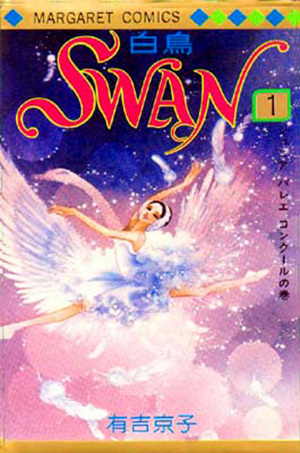 Above, the first volume of Swan, a popular serialized ballet manga from the 1970s; below, the related genre of ballet anime.